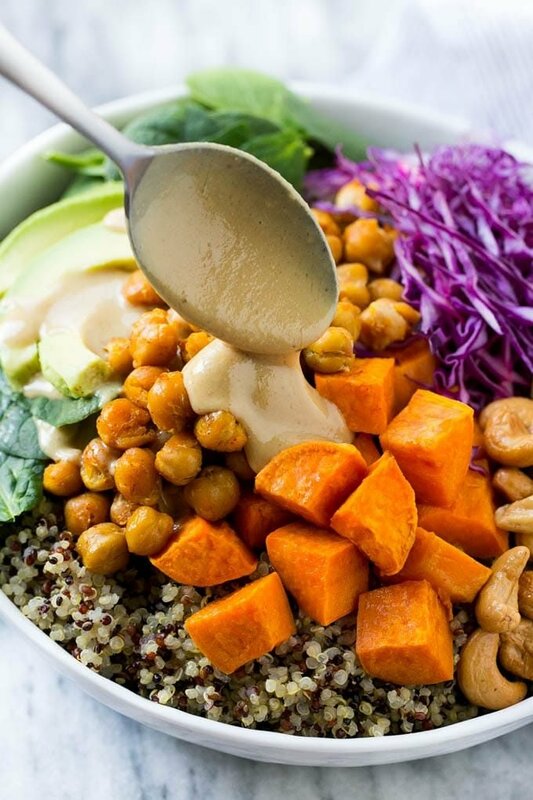 These protein packed vegan Buddha bowls are loaded with colorful veggies, sweet potatoes, roasted chickpeas and cashews, all topped off with a creamy tahini dressing. An easy recipe that’s loaded with nutrition! When I’m looking to eat a little healthier, I often turn to rainbow quinoa salad, Mediterranean farro salad, or these hearty Buddha bowls. You probably know by now that I’m all about the chicken recipes on this site. We eat a LOT of chicken and sometimes I just need a change, you know? I made this Buddha bowl recipe thinking I’d be eating it all on my own, but lo and behold, the kids ate it. They were a little wary of the tahini sauce, but happily consumed the sweet potatoes, chickpeas, cashews and quinoa. In fact I have a photo of my girls happily spooning quinoa into their mouths, because I wanted photographic evidence that it actually happened! A Buddha bowl is a bowl of vegetarian goodies that’s so full and rounded that it looks like a Buddha’s belly. A Buddha’s Bowl often has a quinoa base, but other grains like brown rice would also work. A Buddha bowl is topped with an assortment of vegetables. There are endless ways to put together a Buddha bowl. I went for color, texture and protein here with my toppings of sweet potato, roasted chickpeas, avocado, shredded cabbage and baby spinach. I also added cashews for crunch! 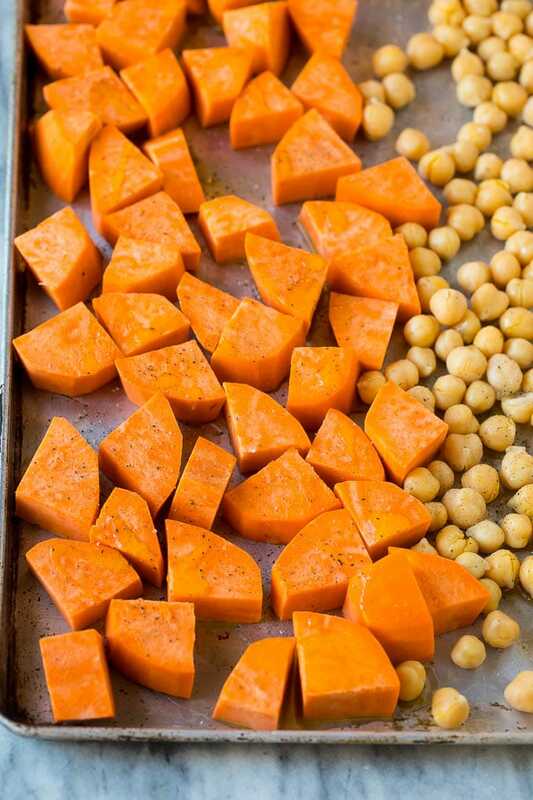 The sweet potatoes and chickpeas roast together on the same pan; be sure to cut your sweet potatoes on the smaller side, about 1/2 inch, so that they cook in the same amount of time as the chickpeas. Many Buddha bowls are topped with tahini sauce. If you’re not familiar with tahini, it’s like peanut butter, except made with sesame seeds. I was able to get a jar of it for under $4. Tahini is pretty flavorful on its own, so I just added a little lemon juice, maple syrup, salt and pepper for a creamy and flavorful dressing. Drizzle a little over the top of your Buddha bowl and you’ve got veggie perfection! You can use any type of grain for the base, other great options are barley, bulgur wheat, farro or brown rice. Feel free to use any veggies you like for your bowls; I like to use mushrooms, butternut squash, kale and tomatoes. These Buddha bowls are gluten free, dairy free and vegan, which makes them perfect for a variety of diets. Plus you just feel good when you eat one, so many nutrients in a single bowl! 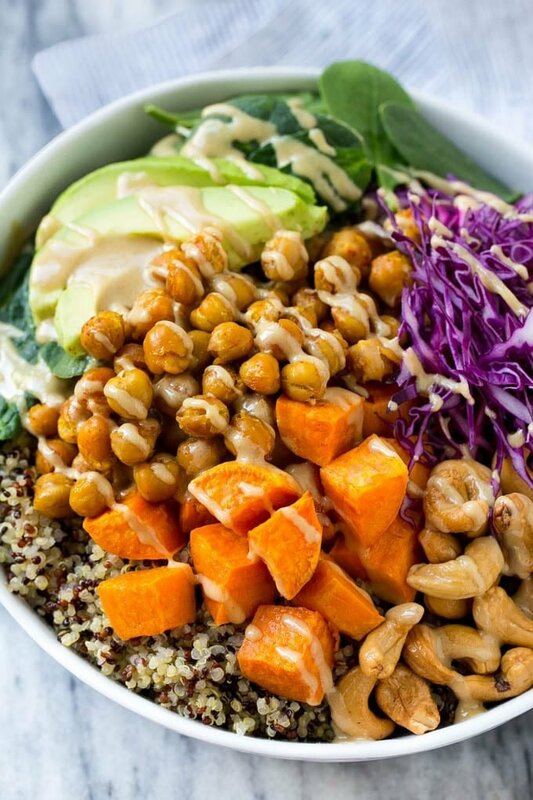 These protein packed vegan buddha bowls are loaded with colorful veggies, sweet potatoes, roasted chickpeas and cashews, all topped off with a creamy tahini dressing. Place the chickpeas on one side of the pan and the sweet potatoes on the other side of the pan in a single layer. 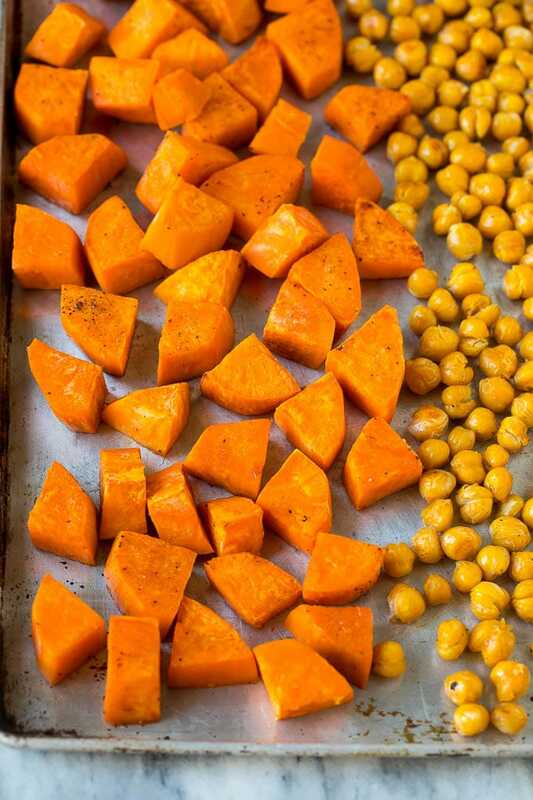 Drizzle the olive oil over the sweet potatoes and chickpeas and season to taste with salt and pepper. Bake for 25 minutes, or until sweet potatoes are tender and chickpeas are browned and crispy. Divide the quinoa evenly between 4 bowls. 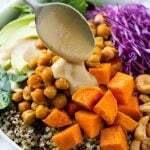 Divide the sweet potatoes, chickpeas, cabbage, spinach, cashews and avocado evenly between the 4 bowls, arranging on top of the quinoa. In a small bowl whisk together the tahini, lemon juice, maple syrup and salt and pepper to taste. Drizzle the tahini dressing over the buddha bowls and serve immediately. This post was originally published on February 20, 2017 and was updated on April 11, 2019 with new content. Talk about clean eating! Love how many flavors are packed into one bowl; looks delicious! I love all the colors in this healthy dish! Looks refreshing and fulfilling; yum! I absolutely love buddha bowls. This one looks fantastic. Love the flavors and roasted cashews. Just yum! Must save this for next week to give a try. Wow, all those colors and just what I’m needing this time of spring! I can’t wait to make this as a meal prep lunch. Thanks for sharing!! 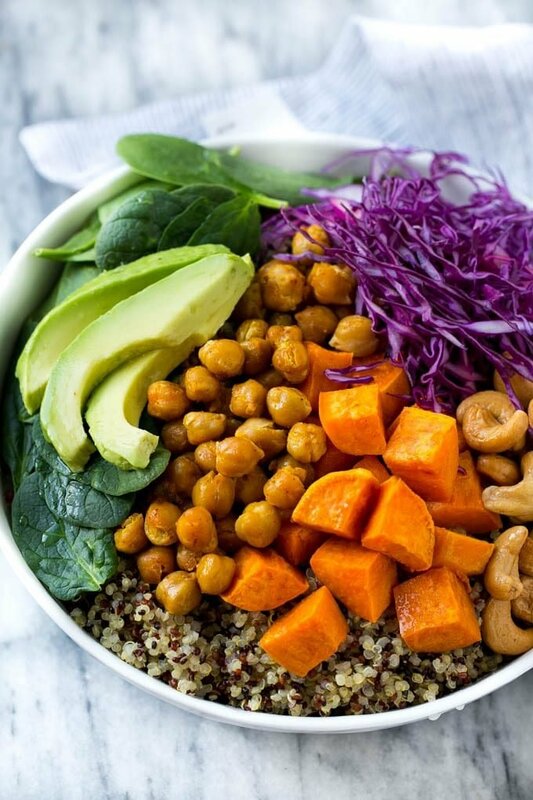 Love all the ingredients in this buddha bowl! I have never roasted chickpeas even though I use them a lot! Def want to try this recipe! I love the combination os colors, flavors, and textures happening in this bowl! We practically live on bowls in the summer, and I’ll be adding this one to our list. I love a good buddha bowl!! The tahini dressing and the cashews looks like the perfect additions. I’ll be adding them to our next bowls!! Looks so good! It’s perfect for my family as we have 2 Vegans to please! This looks great! I think about taking it to the office for lunch. Thank you so much ! 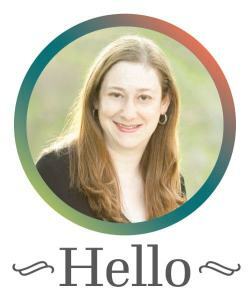 This is a very cool idea! It looks so healthy and flavorful!